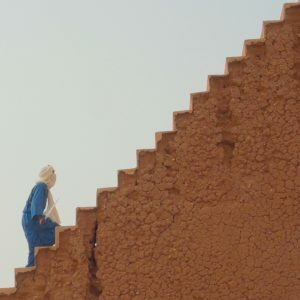 We’ve just wrapped up the new album from Agadez wedding band Etran de L’Aïr. Recorded in 2014, and featured previously here on the blog, it’s been a long time coming. Even longer, if you consider the history of the band. The music scene in Agadez is still dominated by weddings. While the religious marriage is private, the party is a fête for whomever is in earshot. Bands play for a fee, supplemented money that is showered over them whilst playing. The down side to this lucrative scene is a cut throat competition with espionage, theft, and even black magic, creating a very peculiar undercurrent. Etran de L’Aïr remains largely outside of this surly competition: the best wedding contracts are awarded to musicians with social standing, tribal affiliations, and family connections, and Etran does not belong to the upper class. “They make music for people who don’t have money,” says Ahmoudou Madassane. “If a wedding can’t afford the expensive musicians, they hire Etran.” So while the band continues to gig constantly, outperforming all other bands, they still find themselves in dire straits, confined to a DIY aesthetic of out obligation. Their drum kit is dented and the cymbals are cracked, with bites taken out of them. The amplifiers could just have well have been excavated from desert sands. Nevertheless, the band not only makes the equipment work, they make it sound amazing. Etran also has a unique solidarity that’s missing from other groups with their revolving door of contract musicians. Etran is not just a musical group, but a family collective. The group was formed in 1995. Agadez was much smaller then, few homes were electrified, and guitars were rare. “When we first started to play in weddings,” Abindi explains, “we only had one acoustic guitar, and for the percussion, we hit a calabash with a sandal.” As new technology found its way to Agadez, they band adapted, amplifying the acoustic guitar with a transducer microphone, acquiring electric guitars, and finding a drum set. As the family grew, so did the band, integrating the younger siblings into the musical group. 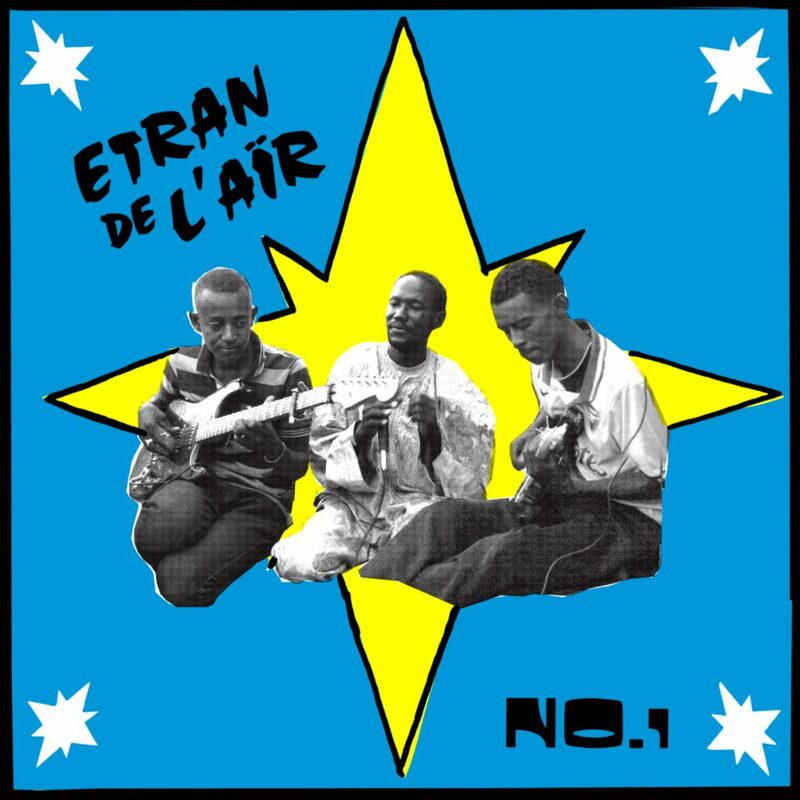 This is Etran de L’Aïr’s debut record. They claim to have written over 40 songs but none of them have been released until now. 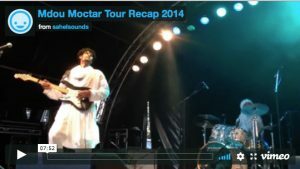 This session was recorded live, outside of their family compound in the outskirts of Agadez. The impromptu performance drew the entire neighborhood out of their houses, eliciting the audible clapping, shouting, and ululation. It is here as it was played, with all the enthusiasm and passion of an evening at the end of the raining season one day in Agadez. The limited edition of 1000 featured hand-assembled offset covers from Stumptown Printers, created in true analog style with a throwback to 1960s West African cover design, with exacto cut letters, hand-drawn illustration, and litho-masks. There’s a lot of variation, and no two jackets are identical (more info on the printing process here). You can grab the album now from our shop or bandcamp. Wow, again a surprise on Sahel Sounds. Music strait out of the streets from Agadez. Who cares, and please no excuses for, the sound. This is how music has to be.